The American Frontier. Having lived in the Midwest for most of my life, I can tell you that there are parts of it that – stretching on and on for what seems like endless miles – feel haunting and foreboding. Especially at night. Here, under nights with a sliver of the moon, even the wheat fields can be damned frightening. "first time director Emma Tammi delivers a very haunting and disturbed tale"
But what if there actually is something out there? A demon; an ill-causing spirit; or perhaps something worse than that is out there disturbing the fields and the farm animals? And if you are alone, well, what can you do about it? Because there are voices in the wind and, sometimes, there are shapes and faint scratches at the door. 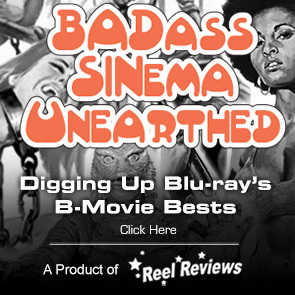 Thanks to an ambiguous (but well-written) screenplay from Teresa Sutherland, there is an echo of horror through this narrative which tells us that something out here is just plain wrong. With so many possibilities, it is a wonder that this land was ever tamed in the first place. 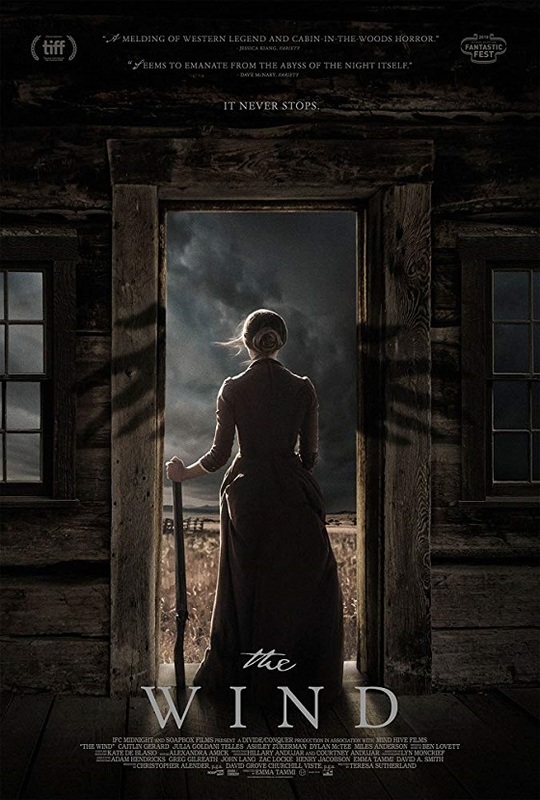 Exploring that idea, first time director Emma Tammi delivers a very haunting and disturbed tale as one prairie wife, Caitlin Gerard as Lizzy, guides us through a very haunted landscape. Combined with some stunning visuals from cinematographer Lyn Moncrief and a creepy score by Ben Lovett, The Wind is a shockingly unsettling portrait of frontier life. The Wind begins with one of the most shocking openings I’ve seen this year. It is purposefully slow as we see a typical farm house from the American Frontier circa the middle part of the 1800s with two men standing outside of its front. They are waiting. It is then that Lizzy appears on the front porch, clutching a dead baby. She is covered in blood. The baby is handed off to the baby’s father, Gideon (Dylan McTee), who begins to wail as he carries the baby to the freshly dug grave. Unsettling is one way to describe this opening. Lizzy’s face says it all. What the editing and the purposeful pacing of the film eventually reveals to us is the truth of this hard country: Emma (Julia Goldani Telles), Gideon’s wife, has taken her own life. She is buried with her baby. And then Gideon leaves, leaving his homestead for the ground to swallow and Lizzy’s husband Isaac (Ashley Zukerman) to get rid of his things. But something is amiss. 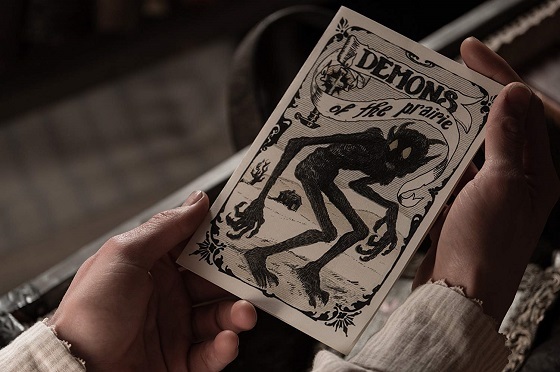 Isaac has to be gone from the farmhouse often and, as the narrative is told in flashbacks and edited in such a manner to challenge our awareness of just what is going on in the relationship between Lizzy, Isaac, Gideon, and Emma, we begin to see that there is something supernatural startling Lizzy. But is it something that is actually happening? Our eyes tell us one thing, our common sense tells us something else entirely. Somewhere in between, maybe, is the truth . . . and it arrives with a soft-spoken Reverend (Miles Anderson) who waxes poetic about the harshness of the land this frontierswoman must withstand. Demons on the prairie. Believe it. The Wind, presented by IFC Midnight, shows you why. The film is now playing in theaters. Memorable Movie Quote: "Are you out here alone?." Synopsis: An unseen evil haunts the homestead in this chilling, folkloric tale of madness, paranoia, and otherworldly terror. Lizzy (Caitlin Gerard) is a tough, resourceful frontierswoman settling a remote stretch of land on the 19th-century American frontier. Isolated from civilization in a desolate wilderness where the wind never stops howling, she begins to sense a sinister presence that seems to be borne of the land itself, an overwhelming dread that her husband (Ashley Zukerman) dismisses as superstition. When a newlywed couple arrives on a nearby homestead, their presence amplifies Lizzy’s fears, setting into motion a shocking chain of events. Masterfully blending haunting visuals with pulse-pounding sound design, director Emma Tammi evokes a godforsaken world in which the forces of nature come alive with quivering menace.